Target Audience: James Clear is an author, entrepreneur, and photographer in 25+ countries. JamesClear.com is the home of his writing and work. Gene Hammett: Hi, my name is Gene Hammett. I’m the host of leaders in the trenches. My big question for you today is how long does it take to create a new habit? One that empowers you, it gives you energy adds focus to your life. Well, a lot of people say it’s 21 days. 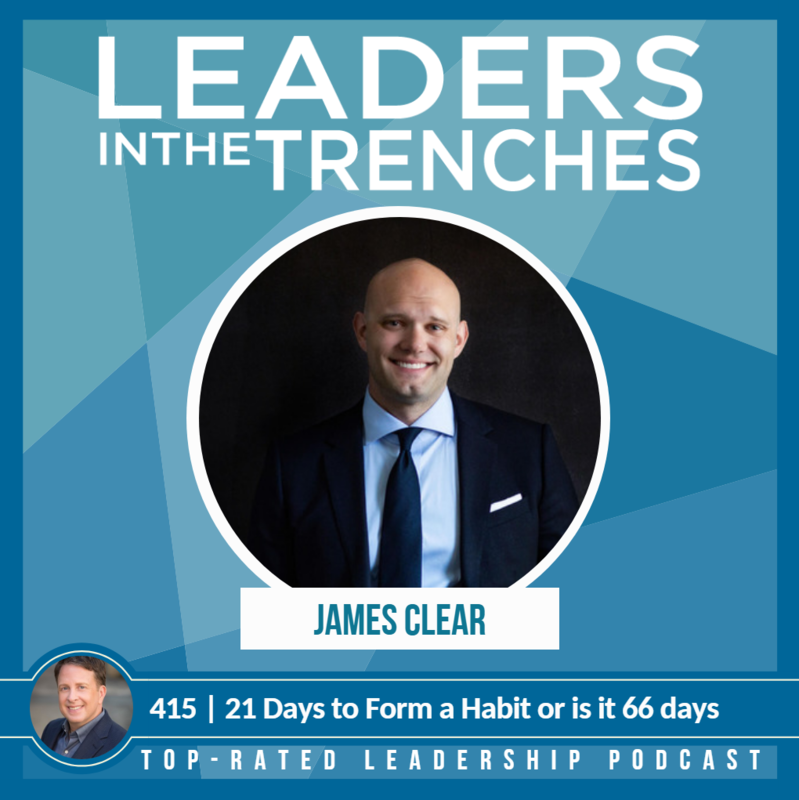 A lot of people may say it’s 66 days, but inside this episode, we share with you with an expert, uh, the author of Atomic Habits, James Clear talks about how long does it take to create a habit and what you really need to focus on instead. And really some of the core concepts of, you know, where do you start with better habits? What do you do to really change this aspect of the finish line, which is one of the ways I approach a lot of my habits and goals. 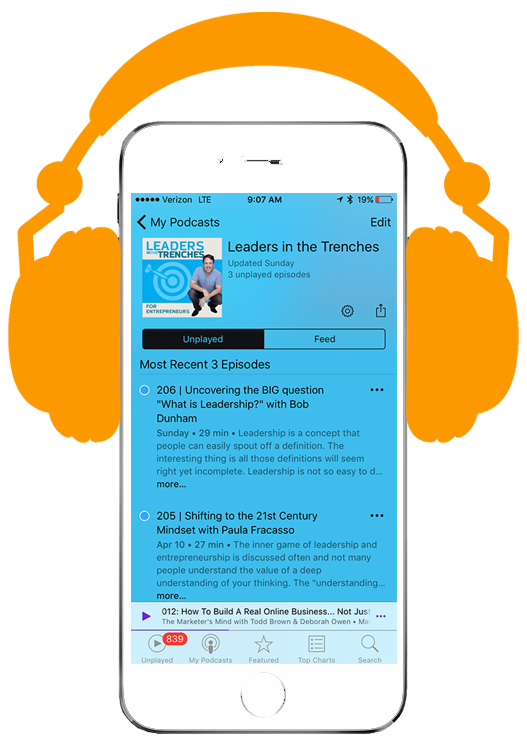 Gene Hammett: So we have a lot of conversation around what does it take to have better habits, increase the effectiveness of it, and really shift some small things inside there that really make it worthwhile. We share a lot of details that you could apply tomorrow to change your life. So here’s the interview with James Clear. Gene Hammett: Hi James. How are you? James Clear: Hello. Doing well, thanks so much for having me. Gene Hammett: Well, I’ve already let our audience know a little bit about you, but I want them to hear it from you. So tell us about who you serve and a little bit of your background. James Clear: So I write about how to build good habits and break bad ones. And I’ve been doing that for about six or seven years now. Um, I write for the first few years, I wrote two articles a week on behavior change and science of habits and peak performance at jamesclear.com, which is still where I write today. Uh, and so after doing that for a few years, I signed a deal to write a book. So I spent the last three years writing atomic habits, which is kind of my most comprehensive view of those topics and how they work. And now I write a weekly or so, uh, about those topics and sharing it. And, uh, along the way, um, I’ve been lucky to have it be shared in a variety of media outlets and for the book to do very well and things like that. So that’s been great. But in addition to the writing, I also do speaking, so occasionally I’ll talk on these topics or train people at larger corporations are startups and uh, and I also have an online course called the habits academy that is sort of like my online training platform for how to build good habits and break those ones. Gene Hammett: Yup. Habits are such an important part of my own life and I know they’re important to others. Like, we know what happens when we have bad habits, right? We get fat, we have bad teeth or things like that. But yeah, business, it’s so easy to fall into, pray a bad habit and not even know it. can you talk a little bit about that? James Clear: I think, you know, a lot of people, anybody who’s running a business as in thick of it can tell you that they’re just busy. Do you know? I mean, it was just things that needed to get done. And so I think a lot of bad habits are not bad habits that are made, uh, maliciously or out of choice, but they just kind of happened to you along the way while you’re trying to get the other stuff finishing a completed. So, I think for a lot of entrepreneurs, bad habits creep up on them rather than a, you know, being some conscious decision or even some like deeper advice. It’s more like just a consequence of the fact that there are trade-offs and that we have, you know, you can only spend your time, uh, in one discrete area at a time. James Clear: And so, um, so a lot of those things just kind of a, they weave their way in without necessarily wanting it. And, uh, sometimes we’re blind to those things. You know, like I know for example, early on in my entrepreneurial career, and I was guilty of this too, uh, I had a lot of friends who just didn’t know the numbers in their business. They were too busy doing the day to day work. Right. Like trying to make things happen and create products and market things and launch them that they didn’t necessarily know how much money came in last week and how much one l and maybe they’d have big picture, you know, at the end of the year or something, but, uh, those day to day choices and then all of a sudden you turn around one day and you’re like, oh, whoa, cash flow is an issue. Or you know, some other things sneaking up on me or we have a big expense that came in this month. James Clear: I wasn’t expecting and I wasn’t ready for it. And so financial habits and having a handle on the numbers in your business. That’s just one example that I think a lot of small business owners, entrepreneurs feel because they’re so busy doing the other stuff that, uh, that that kind of gets pushed to the wayside. Gene Hammett: I just had a client that went through this James where we had to, and it wasn’t even my, my suggestion, I said, you know, what is the biggest point of stress and your business? He goes, I don’t know where I stand. And I go, what do you mean? He goes, well, financially, I know I’m selling things and I know there’s cost structure, but there’s never enough money at the end of the month and at least from a profit standpoint where I think it should be. And so he spent two days doing it. Gene Hammett: He made excuses. It first he spent two days doing it and just talking to him, he felt so light, having a better picture. And because one of the things he wanted to do, James was to be, have financial freedom. And we looked at his business. He had more passive income coming in. Then he had like all of the outgoing, I’m like, that’s what we call financial freedom. He didn’t even know it. Right. How do you get people to make changes toward habits when they want to make the changes? I know it’s really hard, but how, what are yours, what are your thoughts there? James Clear: Well, so similar to the process that you just described, one of the big pieces of changing habits and uh, and kind of like initiating that process of improvement, whether it’s in your business or for yourself, is getting an idea of where you stand. James Clear: It’s a, and so this is one of the first exercises that are recommended. Atomic Habits, the habits scorecard. And so the basic idea is you just make a list of all of your behaviors and as granular detail as you can muster. So, you know, I wake up, I turn off my alarm, I browse social media, I get out of bed and make my bed and take a shower or whatever. And uh, you just have that full list there. And once you have that, then you can start to go through it and assign a positive or a negative score or neutral, to each one, you know, like give you an idea of where you actually stand. And the point is not to judge yourself for your faults or to praise yourself for your successes is just to get an idea of where you’re at. Because one of the challenges similar to not knowing the numbers in your business, one of the challenges of bad habits is that they were often blind to them. James Clear: You know, we just kind of do these things on autopilot. We don’t realize that we’re browsing social media as soon as we turn off our alarm in the morning or the first thing we do is turn off the alarm and then open up email and start browsing that sounds like, should, you know, should I be checking emails before I’ve even taken a step in the morning? Probably not, but we don’t know that we’re doing everybody because we just don’t think about it. And so that process of the habit scorecard helps you think about it. And once you’ve done that, once you have a better idea of what is actually going on each day, well then you’re in a better position to start to change it and do some of the other things that I talked about as far as shaping behavior and restructuring your habits. Gene Hammett: When I think of habits change, I think of the morning routine is a way to start the day. I’d love to know what your morning routine is and maybe some of the things that are maybe different than what others are doing right now. James Clear: Yeah, sure. So I think a lot about environment design when it comes to building better habits. So how can I create a space that leads to more productive or more healthy or more beneficial choices? And, um, so my morning routine is actually very short, but I think it helps prime the environment for the successful things that come throughout the day. So, you know, I have basic stuff, right, and make my bed, take a shower, get dressed. Um, but when it comes to my morning routine for actually getting work done, uh, I get a glass of water, I walk into my office and I leave my phone in another room until lunch each day. So, that’s like the big key that determines whether or not I’m making a good amount of progress. James Clear: So I don’t, I don’t always do it, but on the days when I can do it, man, it really helps a lot. Um, the thing that I learned with through that, which I think is an applicable more broadly to lots of habits and not just morning routines, is that if I had my phone next to me, then I’m like everybody else, I’ll check it like every three minutes. Right? Um, but if I leave it in another room, I have a home office, so it’s only 30, 45 seconds away, you know, it’s just like down the stairs. But I never go get it. And so my question is like, well, did I want it or not? You know, when it was next to me, I wanted it bad enough to check it a hundred times before noon, but when I didn’t have it in the same room, I never wanted it bad enough to go down there and work 45 seconds to get it. James Clear: And, uh, I think the tech that is kind of a signal of how technology has shaped a lot of our modern habits. You know, technology has made so many things so frictionless, so convenience, so easy that we find ourselves sliding into these habits at our slightest whim, you know? And, um, if you can restructure the environment to make that a little more difficult, what you find is you often did want to do the harder work. You know, like I, I had to leave my phone in another room and, uh, also locked myself out of social media, uh, to finish writing the book manuscript. But what’s interesting is I did actually want to write the book. I did want to do the harder thing. I just had to remove the frictionless super convenient stuff before I could sit for 10 seconds and let that urge pass and then work on the difficult thing. It’s kind of like removing the mental candy from your environment. You know you do that and it’s a little bit easier to eat the healthy stuff. And so, um, that process of trying to make the good habits easier and more convenient and more frictionless and change the environment so the bad habits are harder. That I think is a useful way to spend your morning routine or really just anytime you’re trying to prime your habits. Gene Hammett: When, when you talk about that, I mean I totally get it. One thing that comes to my mind was how does a leader who’s running a company with 10 or 20 or a hundred employees help their employees have better habits that serve not only the employee but also the business. One of my core, I’m a speaker as well. James and I talk about high growth companies, put employees first. So I’m not going to say the habit should reinforce like we want to get more sales out there, but how does a leader go about establishing better habits for their 13? James Clear: Yeah, that’s a great question. So when it comes to business, I generally divide the most useful habits into two categories. So categories that I would call habits of energy and habits of focus. So it’s hard for any business to grow if it doesn’t have energy and that energy comes from the individual people who work there. James Clear: What the, if you can get your employees to show up in their best way each day, right to like be bringing their best self to work, they have a lot better chance or shot of doing great work. So habits of energy are a very personal thing, but it’s usually things like getting enough sleep each night, make sure that you’re eating fairly well, exercising a few times a week. Maybe it’s taking a walk outside each day. You know, it’s going to depend on the person, but you asleep is a pretty universal one, for example. Um, but having and mastering those key hub, what’s of energy is probably one of the best levers that you have for doing better work. You know, like we read all these articles, things like how to double your productivity or eight strategies that you can use to get more done this week. I mean, the most meaningful strategy is the simplest one. James Clear: Get eight hours of sleep, you know, like the stop reading articles on how to double your productivity and get an extra 30 minutes of sleep. Um, and that’ll probably do more for you than a lot of those other habits and tactics. So habits Menergy are crucial. Uh, as a leader, what you can do is one model that behavior yourself. So make sure that you’re showing up as your best self each day and to a lot of the job of the manager or a CEO or a leader, the further you climb, the more your job is. Uh, either big-time sales. So interacting with clients and making, closing some of those big deals. And I’m reinforcing the mission in like a thousand of saying the same thing, but like a thousand different ways, right? How can I, how can I find a way to tell people you need to value yourself. James Clear: You can get good sleep. You need to take care of yourself, you need to make sure those habits of energy are dialed in without saying that every single day. Right? How can I find different ways to say that? And so it’s mostly about spreading that mission and modeling that behavior. So those are habits of energy. And then the second piece, which is more related to the workplace itself, unless, uh, for the actual individual, uh, what they’re doing, you know, going to sleep and whatnot are having to focus and habits of Focus, uh, are things like leaving your phone in another room until lunch each day. Now, of course, that particular habit does not work if you’re like a sales team that needs to be on the phone calls. But no matter what the task is that the employees are working on, there are all kinds of things that are not related to that task, that are distractions and habits of focus. James Clear: Ask you to remove those things from the room just as I removed the phone from my desk and writing environment. And so the question is like, what are all the things here that are taking people off course? What are all the things that are not essential? Um, and focusing only on the key pieces that people need to succeed. How can we create an environment where those things are obvious and available and visible and an environment where all those distractions are hidden and less likely to be seen. Gene Hammett: When I listened to what you’re saying there, James, I pick up on a lot of it is about subtracting something from your life, not adding too. Is there something more to that and from the science side of why these habits stick well? James Clear: So I like to, sometimes I like to use the metaphor of like, imagine you have a garden hose with a bend in the middle. Right? And if you’re talking about business or personal life, uh, getting results is like kind of getting more water to flow through those. Okay. James Clear: And this, there are two ways to do that. The typical way is to say let’s crank up the valve and force more water through the vent, right? So that’s the conversation of you need to have grit, you need to have willpower, you need that perseverance. You need to work hard, you need a great worth work ethic. People put more effort in and get more water out and so on. But there’s also a second way, which is you simply remove the bend in the hose and you let water flow through naturally. And that is the subtraction method that you’re talking about here. Let’s, you know if you have a box sitting on a table and I’m standing on one side of it and I had my arm against it, if you want to push that box over the table, you could either overpower me and push harder, right? James Clear: And get it to the other end. Or You could simply just ask me to move out of the way, in which case it’s much easier to push, push the box across the table and subtraction and removing distractions. Removing the bend in the hose is about getting out of your own way. It’s about removing those barriers that are holding people back. And the thing is, if the goal if the result that you want is to get more water through the hose or to get the box across the table, either strategy works just fine, right? So like you don’t need to, you don’t need to have a bias toward the hard work and the willpower one. If the other one, we’ll get you the results in the same way. The other thing to consider is that I’m all for hard work and effort. Uh, I think it’s great. James Clear: Perseverance and grit are very good qualities, but trying to overpower the tension, the, uh, the friction in your life or in your workspace adds tension to your life and increases the overall amount of stress that the system feels. Whereas reducing the distractions and subtracting the things that pull you off course reduces tension and removes the stress that the overall system feels. And if you want to really well-humming machine from a business standpoint, then you want as little friction as possible, right? You want things to be fluid and moving smoothly. And so I think removing those distractions is an underrated or underappreciated method for getting results moving forward. Gene Hammett: You know, and it takes me back to the example you gave us, which is leaving your phone in the bedroom versus bringing it to your office. Uh, that’s a lot cheaper than finding the right app to turn off all your social media and all the notifications and then turn them back on and all the scheduling and whatnot you’ve just made the like, what’s the simplest choice? Well, not bring it in the office. James Clear: I can pay rescue time like $20 a month or I could just leave it in the other room. Gene Hammett: When you think about habits, you know, there’s that science out there, and I don’t even know if it’s real science. It takes 21 days. I’ve heard it takes 63 days and know you get asked this a lot. What is the real truth about creating habits that last over time? James Clear: So the, that, that question, how long does it take to be able to have it? Certainly one of those common questions, I get 21 days, 30 days, 66 days is the popular one that’s kind of like flooding around right now. There was one study that showed that on average took about 66 days to build a habit, but even within that study, the range was quite wide. Um, you know, it was like a couple of weeks for something simple like drinking a glass of water. It was seven or eight months for something more complicated like going for a run each day. And so the range is so wide that I don’t even know that the average really tells you very much. But the real key here is that I think when people ask that question, how long does it take to build a habit? There’s often, they often have like an underlying assumption behind it, which is like, well how long until it’s easy, you know, or like how long until I don’t have to put an effort in it anymore. James Clear: How long until this is done? And I think the honest answer to how long does it take to build a habit is forever. Because once you stop doing it, it’s no longer a habit. And so what I, what I like about that way of looking at it is that you realize that habits are not a finish line to be crossed their lifestyle to be lived. And once you start to embrace them as a lifestyle, as a system, as a process rather than some, um, you know, event or finish line or one time occurrence, you start to realize, okay, I need to make changes that are small and sustainable, that are not threatening, that are reasonable enough for us to stick with and build upon for the long term. And so I think it changes and shifts your focus a little bit from trying to do something ambitious for 30 days or 66 days or whatever. And then hoping it will magically get easy to, well how do we actually build like some small incremental change that we can step up on and then use that as like a new foundation for the next change after that. And this is why I believe in that concept of trying to get 1% better each day. You know, like that plays a key role in the book and in my work and I think it, it hints it this overall philosophy of habits as a lifestyle rather than as a finish line. Gene Hammett: When, when I think about some of the milestones I’m trying to reach with a big goal, I’ve noticed, specifically if I had something to shoot for, if there’s a date on the calendar, I’m looking over at my, actually I have a habit calendar. I don’t know if you’ve ever seen these. I’m going to move this around. Can you see that? Yeah. James Clear: Look at that. You’ve got, you’re crossing the days off. He got the x’s on each day. Gene Hammett: I’ve got xs on each day, which means something related to nutrition and working out. I’ve got red is my meditation and I’ve got blue is my Brazilian Jujitsu. Gene Hammett: I’ve noticed though when I have a milestone two weeks out, six weeks out, two months out, I can stay more in tune with habits that will reinforce that. Have you noticed that within your research? James Clear: Yeah, so, uh, this is something that’s called the finish line effect of the closer that you get to that finish line. The more that it’s insight, the more motivated you are to complete the job basically. And so having that clear target, uh, helps keep you motivated and keep your sights set on the goal, right? Your eyes on the prize. Um, it can be very effective from a longterm view from the view of building habits and maintaining them over time. One issue or challenge that people sometimes face is what I call this like Yo-yo effect. So you start working towards something. Let’s say you’re like, all right, I’m going to run a half marathon. And so then you start training for the half marathon. That’s that deadline on your calendar, right? And you’re six weeks out, four weeks out, you’re two weeks out, your training is going great, then you run the half marathon and after you’ve crossed that finish line, now you don’t have the deadline to move you forward anymore. James Clear: And so a lot of people find that, oh, I took a week off and then a week turns into a month and then like three months go by and they’re like, man, I haven’t run since that race. Yeah, I got to get back in shape. I got to pick another half marathon to get me back on track. So, the challenge with it is that you need to continue to move the Mile Post. Um, you know, you need to continue to have a new thing to shoot for and that can be fine as long as you don’t fall into the trap of always feeling like successes after the next one. Right. Because then you end up feeling like unhappy because you’re like, well, it gets me to work hard, but I never feel like I’m there. I always feel like I’m not quite enough or you know, after I do the next race then I’ll be in shape or then I’ll be good. James Clear: And so the way that I like to invert that or a workaround that possible pitfall is to focus on what I call identity-based habits rather than outcome based habits. So an outcome based habit is focused on the half marathon and identity-based habit is focused on being a runner or an outcome-based habit is focused on writing the book. And identity-based habit is focused on being a writer. And so when you focus on the identity now you can feel successful. Anytime you run, you go for a training run, great, you’re being a runner, you sit down and write one sentence, great, you’re being a writer. And so by adopting that identity and reinforcing that belief of this is who I want to be, it gives you a reason to feel happy and satisfied at the moment while also working toward that longterm outcome. Gene Hammett: I liked the way that is because I know that a lot of leaders are, are challenged with this. They stay the same because they’re not willing to ship their identity or they don’t know they have to. And when you, let’s say you’re struggling with weight loss, if you always think of yourself as a fat person trying to get thin, you never get thin because you’re just this, there’s a struggle there. Whereas if you can shift the identity too, I’m a thin person or I’m an athlete or whatever it may be, you can figure out the habits to get there. Does that make sense? James Clear: I liken it to, you know, imagine you have two people and you offer one of them a cigarette and they say, oh no thanks. I’m trying to quit than any other person. You offer them a cigarette and they say, oh no thanks. I’m not a smoker. It’s the same behavior. The broke turning the cigarette down. But the first person still identifies as a smoker, right? Who, and they’re trying to be something that they’re not, whereas the second person no longer identifies in that way. And so they mentally, at least they’ve gotten out of their own way and it becomes easier to stick to that behavior. So this is something that you mentioned that you know, leaders like sometimes don’t realize a need to upgrade or expand their identity or shift in some way. And this is a truth about all the things that we’re talking about. James Clear: Habits here, which is that they can work for you or against you, right? Habits are a double edge sword. So you’ve got good habits and bad habits. And so when you adopt identities that benefit you, like I’m the type of person who doesn’t miss workouts, or I’m the type of person who writes every day, or I’m a meditator, those things are great because those worldviews and perspectives help give you a reason to show up each day. But on the flip side, people adopt all kinds of identities and internal stories that prevent them forward. I have a sweet tooth. I’m bad with directions, I’m terrible at math. Um, and all those kinds of things are holding you back from taking those positive actions. So it becomes important to ask yourself like what, what are the internal stories and identities and I’m holding onto and is that the person that I need to be for our business or for my life to go in the direction that it wants? Right? Who do I need to be now? And that question can help clarify what direction you want the business to move in what direction? The way yourself. Gene Hammett: Fantastic conversation here, James and just in case you didn’t mention this or in their early, you have Atomic Habits. Great Book. I really recognize it. I just wrote about it for Inc Magazine when the top books for 2019. So, James, thank you for being here. James Clear: Oh, thank you so much. I appreciate it. And um, yeah, if, uh, if folks want to check out more, you can find some of my writing on habits and behavior change at JamesClear.com and if you want to go straight to the book, uh, you can just check out the AtomicHabits.com. Gene Hammett: Fantastic. So, uh, as always lead with courage. Thanks for being here. Gene Hammett: Love, love, love this interview. It is fantastic to talk about these habits are a big part of my life. I share with you when my habit board around and then I work out. So my nutrition, my Jujitsu, I have a lot of habits around the business, but all this to say, love to be able to help you improve yourself, improve where you’re going, create better habits. And this interview is just to help you do that. If you have any questions about your business, I’d love to connect with you as always, lead with courage and I’ll see you next time.